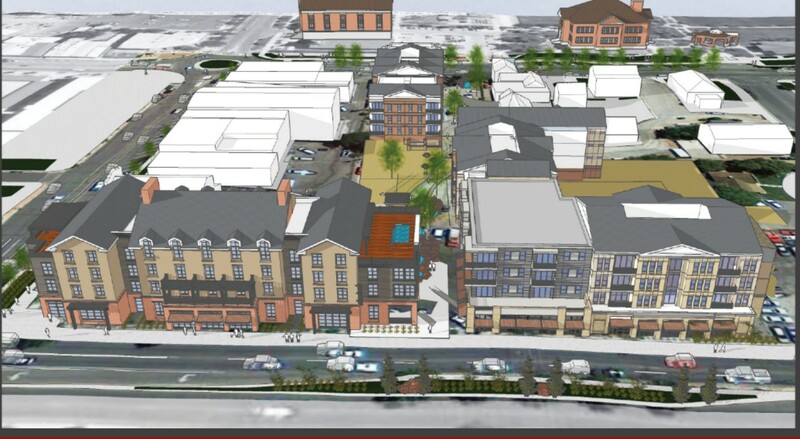 ST. GEORGE – A proposed $30 million development in the heart of downtown St. George is a step closer to reality with the City Council approving a development agreement Thursday night. The development brings in an anticipated mix of commercial and residential space that could break ground later this year. The development will take up the majority of the block between Main Street, St. George Boulevard, 100 West Street and Tabernacle Street. 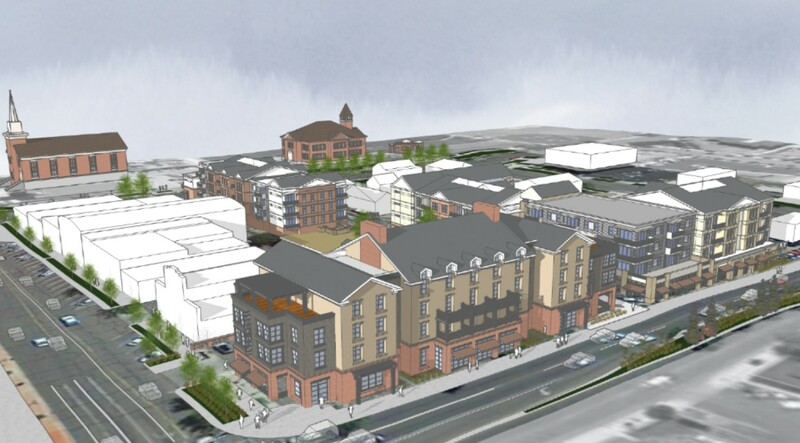 A four-story, 60-room boutique hotel is slated to go on the corner of Main Street and St. George Boulevard. Sitting on the west side of the hotel will be a four-story, mixed-use building with commercial space on the bottom and residential apartments on the top floor. A third building – a three-story, mixed-use complex – will face Tabernacle Street. The development will be tied together by a publicly owned plaza and connect with the Green Gate Village, which will also offer some retail space. Altogether the development will sport 10,000 square feet of retail and office space and 110 apartment units. Parking for the businesses and apartments will be underground. “We’re really excited to present this to the City Council,” said Cameron Gunter, CEO of Peg Development. The proposed development falls within the city’s Central Business District Community Development Area. Created earlier this year and finalized last month, qualifying projects within the CDA would have property taxes frozen in the first year for a period of 15 years. Subsequent tax increases during that time will be applied to projects within the CDA that help make various infrastructure improvements. “It’ll be kind of a new thing for us in the downtown area to try and get more people to live and work and be able to shop downtown,” St. George Mayor Jon Pike said Wednesday. Multifamily housing in St. George is currently hard to come by due to vacancy rates at less than 0.1 percent in the area, according to a recent report from NAI Excel. Together with other incoming multifamily housing projects, the 110 apartments proposed for the downtown project are seen as a start in addressing the issue, Pike said. City Manager Gary Esplin, who has long been a proponent of projects benefiting the city’s downtown, said city staff were excited to see development moving ahead. “We think it’s probably a dream come true for the stabilization of the downtown in the foreseeable future,” Esplin said. Gunter said work on the project could begin in November or December. The City Council approved a general plan amendment changing a 4.7-acre parcel between Riverside Drive and the Virgin River from flood plain zoning to high-density residential zoning. Located just east of Millcreek High School and The Church of Jesus Christ of Latter-day Saints chapel on 2200 East off Riverside Drive, the parcel is slated to be the future site of the River Walk Village, a 40-to-50-unit complex that will offer affordable housing. The land the River Walk Village will be built on is ground that used to be within the FEMA-designated 100-year flood plain for the Virgin River. That distinction was changed in the mid-2000s, city staff said. The property itself sits on the edge of the current 100-year flood plain. The council approved the $180,000 purchase of approximately 2 acres in the Little Valley area along Commerce Drive and Bentley Road for the future location of a fire station. St. George Fire Chief Robert Stoker said ground work and design plans are in the works for the current budget year. Construction on the new fire station will likely begin next summer, he said. Also approved was a professional services agreement for $1.2 million for the first phase of the expansion of the city’s waste water treatment plant. The expansion is taking place to accommodate the city’s continuing growth. This is fantastic news and a great move for St George. this had been an on hold project for quite some time. and we are so blessed two have the city leaders that we have two look out for the best interest of the city and its citizens. Praise the Lord ! Are you confused two ? This is a great development, I like it! I like the multi use approach and ground floor commercial (hopefully retail) in downtown. This will bring more identity and value to the downtown core. I hope it happens! Do they think nature will respect the “No Flooding Zone” signs they plan to put up? I do not think developers care what happens after they sell the places. FEMA allows building in many flood plains but not the most severe. Residents would be wise to buy flood insurance. From what I read after the LAST 100 year storm (5 years ago), if it’s in a flood plain, you cannot get flood insurance. Anyone know if this is correct, or if it’s changed? Will we have to #fundraiser all the fools that decide to live in the buildings that sink? This is fantastic for the businesses and people of st. George. Go to see it in a concentrated area. Now about that traffic problem…. Immigrants from California need someplace to live. For some reason they are able to buy houses. I haven’t figured out how they do it. It appears I did it all wrong for all these years…. You said immigrants not illegal immigrants. So my statement is not specific to illegals. Although, illegals have more benefits than I do as a citizen. The downtown development seems a good thing and in keeping with the Vision Dixie principles of mixed-use development and inward development rather than sprawl. As for the affordable housing by the river, hope those folks can swim. Developers will make their money there and leave others holding the bag – families and the federal govt when they have to step in to help. Hope that doesn’t happen but seems like the handwriting might be on the wall for that deal. Our leaders should step in and stand up for what’s right but that won’t happen.